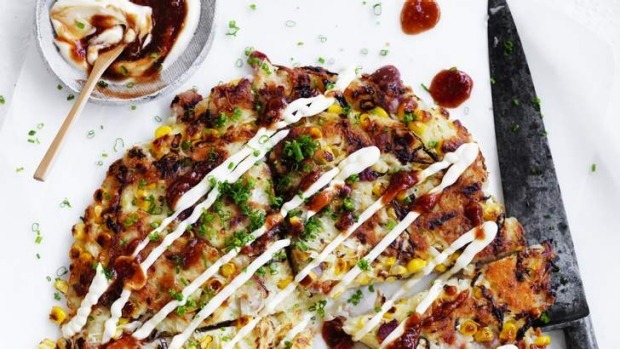 Part Japanese and part Swiss, this fusion dish puts a European twist on Japan's famous savoury pancake, okonomiyaki. 1. Mix together the grated potato, onion, cabbage, corn and bacon, and season with salt. 2. Heat a 26 centimetre skillet or frying pan over medium heat and add the oil. Place half of the potato mixture into the pan all the way to the edge and scatter with the cheese. Top with the remaining mixture. You don't need to press the mixture down. Cook for 10 minutes then place a plate larger than the pan upside down on top of it. Invert the pan and plate to remove the rosti to the plate, then slide the rosti back into the pan so that the browned side is now facing upwards. Cook for a further 10 minutes until the rosti is crisp and browned on both sides. 3. Remove the rosti from the pan onto a serving plate. Mix together the ingredients for the sauce and brush over the rosti. Drizzle with Japanese mayonnaise and scatter with chives to serve.